When was the last time you got a big raise? We're not talking about the 3 percent raise you should get every year to keep your salary in line with inflation — we're talking about a noticeable pay bump to reward you for all your hard work. Has it been a while? You may feel like you're long overdue for that financial reward, but asking for a raise without first recognizing if the timing is right can set yourself up for a disappointing answer. 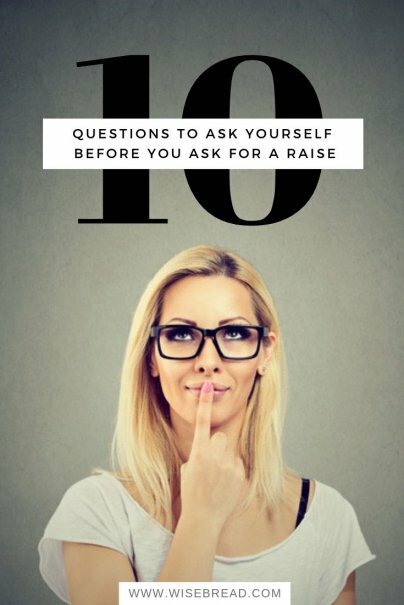 So before you ask for a raise, ask yourself the following questions first. Salaries for identical roles vary from company-to-company, state-to-state, and country-to-country. You may not have had a significant raise in many years, but that doesn't mean you should automatically get one. Take a look at a website like Salary.com and search for your current role, your location, and your years of experience. Don't forget to add in any benefits and bonuses you may get. Now, where do you fall on the chart? Again, this is going to vary depending on your profession and the current state of your industry. But usually raises are given out annually, so if you had one 10 months ago, you shouldn't expect to get a warm reception when you ask for more money. If it has been many years since you had any kind of raise beyond the meager 2 to 3 percent, and you have an excellent work history, you are definitely right to approach your supervisor and talk about money. Now, you could find that certain promises were not kept with regards to commissions, bonuses, benefits, or other ways you were told you'd be compensated. If that's the case, make the reasoning watertight. You took the job based on income you're not receiving, so you would like a bump in pay to make it right. Of course you do, right? Well, maybe not. A fat raise usually accompanies a promotion, more responsibility, or the kind of performance that makes you indispensable. Look at what you've done since the last time you got a raise. Have you been good at everything, or have you been outstanding? Did your performance meet the expectations set by your manager, or did it exceed them? Did you hit deadlines and budgets on the head, or did you come in under budget and ahead of schedule? Money makes the world go 'round, but sometimes we find ourselves wanting more money because the job isn't giving us any other reason to show up. The role may have become stale, or the tasks uninspiring. We're not fulfilling our potential, and to compensate, we want more money in exchange for the torment we endure. 6. How's my company doing? Unless you've been hiding your head in the sand, you should have a good idea of how the company has been doing for the last six months to a year. Is it in a good place, a great place, or have there been troubles? "Because I deserve one" is not a good answer to the question, "Why should we give you a raise right now?" In fact, you shouldn't even let your boss get to that question. Instead, make a case for your raise right out of the gate. Start the conversation with something like, "I've been doing a lot of thinking, and I believe I deserve a pay raise for these reasons." Then, clearly and confidently explain those reasons. Don't be pushy, arrogant, or entitled. The two numbers are not the same. In fact, the second will probably dictate the first, because in the negotiation game, it's always better if you set the "anchor" point rather than the boss. Let's say you want no less than a $5,000 raise. You shouldn't ask for $5,000, because it's way too easy for the boss to talk you down from that price point (they sure won't be going up from it unless they're worried you're about to quit). 10. What's my plan if I'm turned down? Be prepared for the boss to say no. You shouldn't expect to get a raise, or the amount you believe you deserve, even if you think it's overdue. If you walk into the room thinking it's in the bag, and don't have a plan for rejection, things could go badly. You don't want to get upset, angry, or walk out and slam the door.